Is this Chicago heresy? Michael Jordan not being the baseline for all knowledge and inspiration? But Larry Bird? It is what Bulls (and don’t deny it, NBA fans as well) have mostly pined for these last two years as Rose mostly sat on the pine recuperating from knee surgeries. Or plush cushions on the sideline. That being a Rose to bloom in a garden of opportunities. Derrick Rose is back, and so are the Bulls, Eastern Conference contenders as they begin the NBA regular season marathon in New York City Wednesday night in the nationally televised game against the Knicks. It’s Madison Square Garden, which always is significant even as the Knicks mostly have not been these last few decades. But there’s a connection once again with six-time champion Bulls coach Phil Jackson now running the Knicks’ basketball operations. There’s the object of the Bulls’ summer free agency affections, Carmelo Anthony, still starring for the Knicks with a geometrical bent with new coach Derek Fisher and former Bulls assistant Jim Cleamons and the triangle offense. For the Bulls, there’s still injury news, though it’s positive, if that can be suggested, since it doesn’t involve Rose. Bulls coach Tom Thibodeau, who generally is circumspect with injury updates, said after the practice Butler was out two to four weeks, presumably since the injury occurred Oct. 19. Thibodeau had generally been declaring Butler day to day or moment to moment in the game professional coaches play with media and refusing to rule out Butler for the Knicks even though Butler still wasn’t practicing. Then Thibodeau after Butler said he wouldn’t play Wednesday said Butler was out two to four weeks. Thibodeau then amended that when asked to clarify. Butler has said he wants to be cautious this season after returning too soon last season from a turf toe injury in November and having it bother him. So it’s possible Butler could be out another week or two, especially since he’s still not practicing with the team. Though Thibodeau declined to say, Kirk Hinrich started for Butler in preseason games and figures to start against the Knicks. Butler’s absence, even short term, is significant because the Bulls open against the two best small forward scorers in the NBA, Carmelo Anthony and LeBron James Friday in the United Center. Butler is the primary defender against those players. All of that is important, of course, but the principal element for the Bulls to have a successful season is the gold of Rose’s athletic brilliance and the iron of his health. It’s the mettle in Rose. So perhaps it’s a positive Rose was being asked about the health of others and not himself. 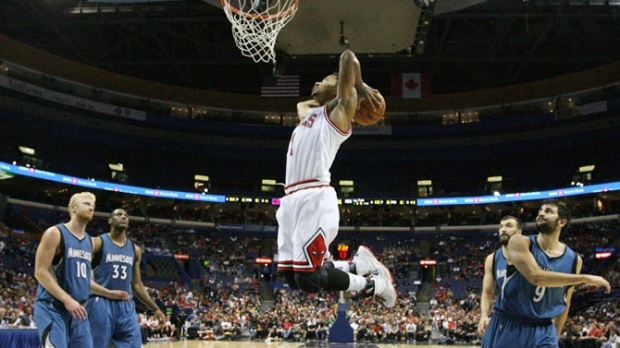 That’s the message for Rose as well, and he is exuding a positive attitude and confidence as the Bulls begin this season of great anticipation. “I think I’m ready,” said Rose. “Not only myself, but I think the team is ready. You can feel the excitement from the city all the way out here. So that’s a good feeling. I’m anxious, but at the same time not as anxious as when I played for USA Basketball. I think my nerves calmed down a little bit. I’m a little at ease right now. Everybody is just ready for the season to start. “I think I’ve been playing great,” said Rose. “Just trying to get a better feel for the game. Picking and choosing my spots, when to really be aggressive and when to hold back. It’s still going to take some time. I’m not worried about that. I might have some bad games here and there. But that’s not going to stop me from going out and trying to be aggressive. (But) I can’t be content with how I’m performing. I have to put it behind me whether it’s good or bad and make sure I stay consistent with my workouts. Physically, I feel good. I have a little cold right now, but that’s not going to stop me. By game time it should be fine. And as for those preseason predictions, well, it’s a long way to go and the test is in the play and not what you say. It’s time for Game 1 of 82 and they all hope perhaps another 20 or so to come.